Jessica to perform at 2014 Commonwealth Games Flag Handover Ceremony! Fresh from her ground breaking performance at Eurovision, Commonwealth Games Minister Jann Stuckey today announced, that Jessica Mauboy will take to the world stage at the official Flag Handover Ceremony (FHC) during the close of the Glasgow 2014 Commonwealth Games. Ms Stuckey said the Glasgow 2014 Closing Ceremony, broadcast to over one billion people, was a fantastic opportunity to give a taste of what our great state would offer when the Gold Coast hosts the Commonwealth Games in 2018. “Jessica is a passionate, energetic and wonderfully talented Australian who is as excited about the Gold Coast 2018 Commonwealth Games™ as I am,” Ms Stuckey said. Jessica’s association with the Gold Coast 2018 bid, began with her performance at the Gold Coast celebration evening during the Commonwealth Games General Assembly in St Kitts and Nevis in the Caribbean and continued with her unveiling of the GC2018 emblem at the five years to go celebration in 2013. Jess performed three songs to a massive crowd on Sunrise this morning, check out the pic below! Make sure you watch her performance of Pop A Bottle, Never Be The Same and Sea Of Flags. Jessica performs at Eurovision & ‘Sea Of Flags’ is out now! To a crowd of over 110 million, Jessica took to the Eurovision stage in Copenhagen, Denmark and performed ‘Sea Of Flags’! Sea Of Flags is available on iTunes and Google Play. Make sure you catch her full performance this Saturday, May 10 at 8.30pm on SBS ONE. Jess in Copenhagen for Eurovision! 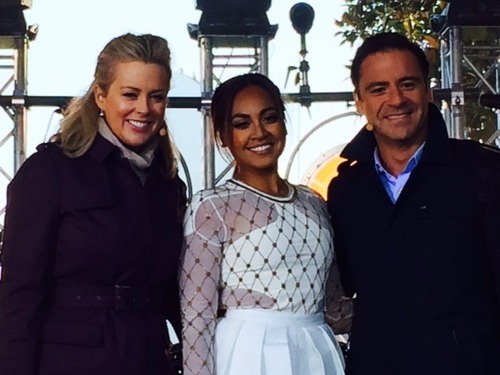 Jessica Mauboy has headed over to Denmark to get ready for her big Eurovision performance! Make sure you’re watching SBS from 7:30am tomorrow to see Jess’ performance, otherwise you can catch her TV special From Darwin To Denmark, and her performance on Eurovision again from 7:30pm Saturday.